Seasonal Occurrence: Common to occasional March through October. Greatest numbers in August. Breeds in our area. Species Profile by Glenn Olsen: This graceful aerialist of southern skies is most often observed in our area as it migrates along the coast each spring and fall. In the fall, August and September are the best months to scan the skies for this beautiful kite. It is a tremendous joy to watch the acrobatic maneuvers of this elegant bird as it pursues and feeds on airborne insects. The general breeding range includes parts of the South and Southwest and scattered locations elsewhere. 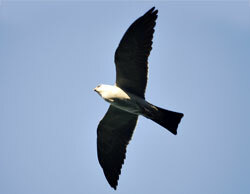 These sleek-looking birds can sometimes look falcon like in flight. The in flight identification characteristics for adults include long pointed wings with dark wing tips (primaries), mostly dark to black tail, pale gray body, and a pale gray to pearl white head with a prominent dark eye area. 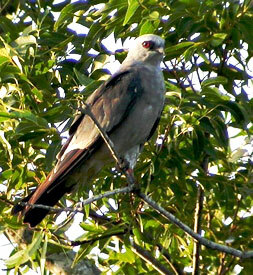 As the kite performs aerial maneuvers while feeding on insects, an observer will often see the upper parts of the bird which show a blue gray body, dark wing tips and tail, and the pale gray to whitish secondaries of the wings may "flash" in the sun as white patches in the wings. On perched adults one can see the rather large dark lore spot in front of the eyes and the distinct red iris and dark bill; all of which contrast beautifully with the pearl white head, giving the kite a regal appearance. Adult male and female plumages are similar, but the plumage of juveniles and sub adults is quite different. Juveniles appear overall brownish with heavy streaking on the breast. The wings may have white speckling, and the tail may have narrow white bands. Sub adult plumage appears closer to the adult plumage but is paler and lacks the contrast in color of an adult and may show some brownish feathers. The iris may be brownish not bright red as in an adult bird. In August, begin looking to the skies for the elegant shape and graceful flight of the Mississippi Kite as it passes through our area migrating south. These birds can be seen from your backyard or in a county park, so there is no need to travel far. However, to be filled with wonder and excitement at the sight of several hundred or more of these beautiful birds, take a day trip to Smith Point Hawk Watch. See you out there!